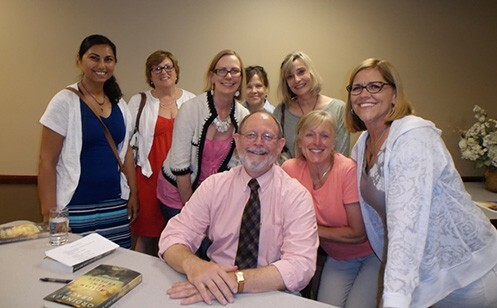 Oh, what a wonderful time we all had on July 30 at the South Lake Minnetonka One Book-One Community event. This was the first event of its kind for which Ordinary Grace has been chosen. The community center was filled to capacity. The audience was warm and receptive. The atmosphere was festive. I was, of course, grateful that everyone had gathered to hear about my book, but I was just as pleased with the whole idea of an entire community engaged in the reading and discussing of a single work of literature, whatever that book might be and whoever the author. Here are some photos of the event. The bevy of attractive and intelligent women surrounding me in this photo is the BFW (Books, Food, and Wine) book group. What a delight they were! And the lovely ladies with me in the second photo are the creative, hardworking folks who made the event such a success—L. to R. Sharon Noble, Peggy Bauer, Pamela Klinger-Horn, and Ellie Temple (of Excelsior Bay Books!). 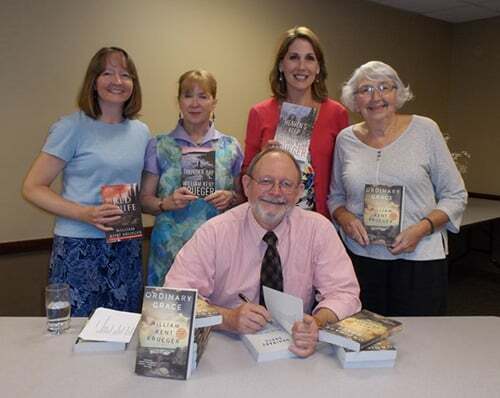 Ordinary Grace will be featured in a number of one book-one community read programs throughout the rest of 2014. Check my calendar for the places and times. I hope you can join us for one of the celebrations. I promise you they’ll be a hoot!